a cappella behind the scenes: 2012無伴奏合唱大師系列 Rockapella! After two outdoor concerts and a very successful a cappella Extravaganza, it's time to be excited for the 2012 acappella Master Series: Rockapella! Rockapella was formed in 1986 and have released seventeen albums to date, both in the USA as well as Japan. We had the pleasure of meeting them during their last visit to Hong Kong in 2006, and we are very happy to welcome them back to the city once again! 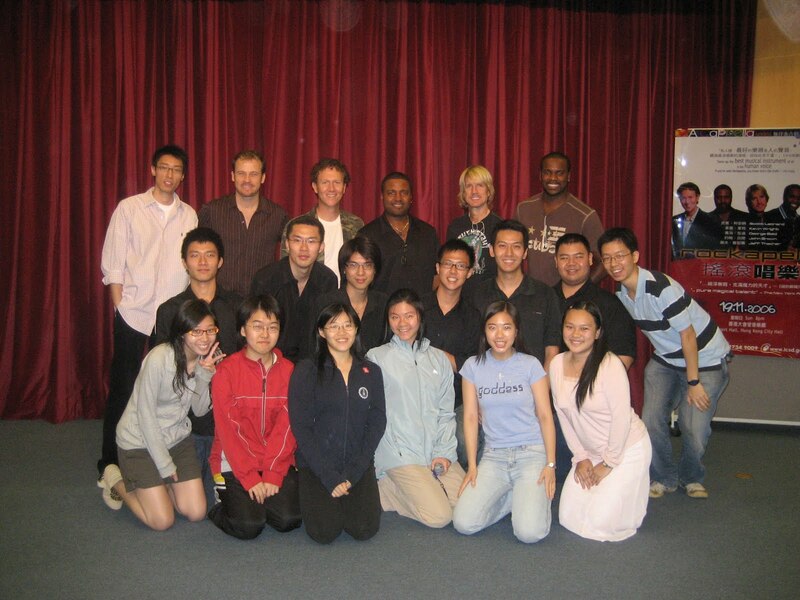 Here is a photo we took with them in 2006. Our previous Master Series concerts have featured The Real Group and The Swingle Singers, and were very well received. Don't miss out on this year's show on April 20! A personal note: Rockapella was my first exposure to a cappella music, as I watched the TV show 'Where in the World is Carmen Sandiego' when I was in primary school! This is still Rockapella's most famous song. Remember to shout 'Do it Rockapella' before they sing this song!